The new football season has arrived! The Sky Bet League 2 season kicks off this weekend (August 3rd) and the opening game sees Rochdale take on Hartlepool United in one of the league’s commemorative 125th-anniversary fixtures. The match, which will take place at Spotland, is the most played fixture in football league history. Dale will be aiming to capitalise on an unbeaten pre-season which has seen them record victories over Halifax Town, Stalybridge Celtic, Northwich Victoria, Macclesfield Town and Winsford United. There were also two draws. Dale were close to seeing off Championship contenders Blackburn Rovers, but for a late Morten Gamst Pedersen goal and also battled to a draw with local rivals Preston North End. The return of manager Keith Hill to the club has given Rochdale fans a genuine sense of optimism. Hill knows how to navigate through the League, twice leading Dale to the playoffs before achieving automatic promotion in 2010. In achieving promotion, Hill ended a 41-year wait and will always be revered by the fans. His return has breathed new life into a side which has struggled for the past two seasons. Hill will look for his team to mount a play-off challenge again. Rochdale can also be backed at 25/1 to win the league with most bookmakers. Competition will be provided in the form of 2008 FA Cup winners Portsmouth, big spending Fleetwood Town, Chesterfield and local rivals Bury. The first derby of the season will take place at Spotland on 7th September. Dale will also face Championship opposition in the Capital One Cup during the first week of the season. They travel to face newly promoted Doncaster Rovers at the Keepmoat Stadium. 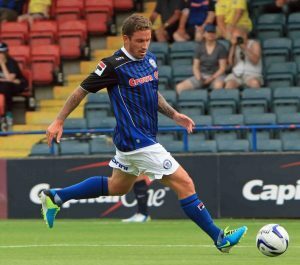 Rochdale will look for inspiration from Captain Peter Cavanagh as well as strikers Ian Henderson and Scott Hogan, who impressed with his goals in pre-season. Fans of the club are longing for a return to the attractive style of play during the promotion season of 2010, following two years of struggle. The playoffs represent a realistic target. Dale should feel confident about finishing in the top seven, having done so on three previous occasions under the current manager. The first month of the season sees Dale face title contenders Chesterfield and local rivals Bury at Spotland as well as tough trips to Oxford United and Burton Albion. The team will be looking to carry their pre-season form into the league and get off to a bright start. We are proud to be sponsoring the team and wish them every success for the season ahead. Up the Dale!